Production of the phytotoxin thaxtomin A by pathogenic Streptomyces spp. is essential for induction of common scab disease in potato. The disease can be significantly reduced by a range of chemicals applied as foliar sprays before tuber initiation. We tested a range of chemicals that had previously demonstrated varying capacities to reduce common scab for both disease suppression and their ability to inhibit thaxtomin A toxicity in both 'Desiree' and 'Russet Burbank' potato. Our results for disease suppression generally supported previous studies. Our tuber slice assays with thaxtomin A showed a strong correlation between the ability of the chemical to suppress common scab symptom development and the ability of the chemical to inhibit thaxtomin A toxicity. 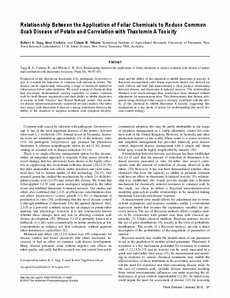 A Bayesian measurement error linear regression model was derived for each cultivar and trial and demonstrated a clear positive relationship between disease and thaxtomin-A-induced necrosis. The relationships obtained were much stronger than would have been obtained without adjustment for measurement error. This demonstrates that disease mitigation using chemical foliar sprays is strongly correlated with the ability of the chemical to inhibit thaxtomin A toxicity, suggesting this mechanism as a key mode of action for understanding this novel disease control strategy. © 2012 The American Phytopathological Society.